Brussels was fun! 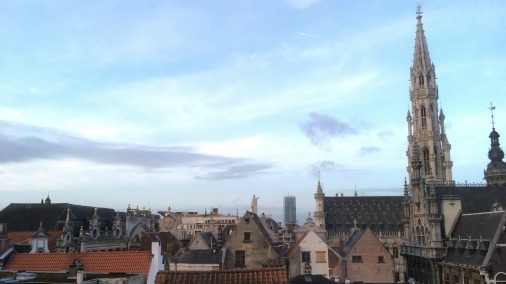 Here is an account of my visit to the Belgian capital for the judging. As the Eurostar pulled out of Brussels Midi station I reflected back on four packed days in Belgium’s capital. I had been judging the Belgian round of The International Chocolate Awards 2017, the first heat of the year. 2016 was an exceptional year for the Awards, with record numbers of chocolate makers, chocolatiers and products entered. And boy were there wonderful things among them! 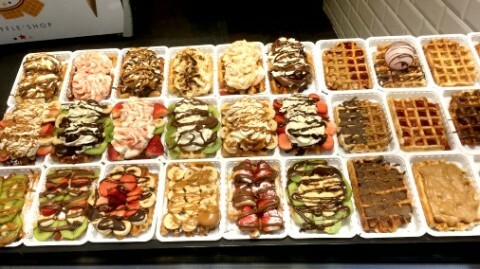 As well as chocolate, there are waffles everywhere you turn. I hadn’t been to Brussels before. Yes, I know, ironic, given that it is in many ways a world capital of chocolate. It certainly considers itself so, and asserts it immediately on arrival. Along with beer, speculoos and waffles, you cannot escape chocolate. 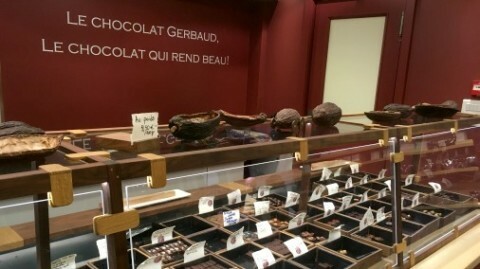 Every second shop is a chocolate boutique. They range from the pile-them-high budget; with mixed packages of all sorts bundled for a few euros, to the highest end, glossy temples to the art. There is a gloriously elegant central square that resembles the Bond Street of chocolate, with many flagship stores – and little else other than antiques and smart hotels. And all of these shops are chocolate specialist places. There may be the odd caramel, or slab of nougat, but what these shops sell is chocolate, chocolate and more chocolate. One of a hundreds (if not thousands) of chocolate shops. That sumptuous window display up close. The tradition of chocolate in Belgium is an historical one, and in many ways its heyday dates from a period when the cacao might not have been of the finest quality, or it might have been difficult to control the processing carefully. Hence the establishment of a style that leans heavily on milk and sugar to mask any defects or over-roasting. 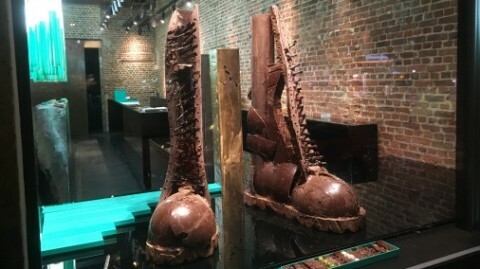 There is much pride in the reputation of Belgian chocolate, and the mastery of chocolate abounds in swirls and flourishes cast in elaborate and quirky moulds. There is also an endless variety of luxury packaging; acres of smart storefronts are dedicated to its display. It all makes for a very tempting walk around town. It is impossible not to feel like a kid in a candy store. 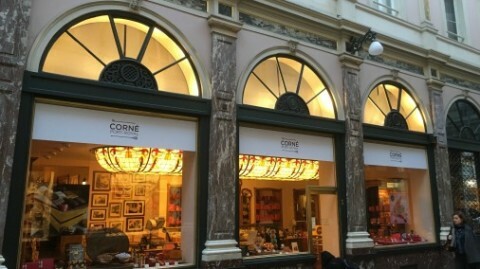 The vast majority of the flavours behind these window displays are sweet, milky or mild, and are made of couverture from the major Belgian brands. I was therefore unsure what to expect from the competition itself, would there be a lack of ideas, or a lack of interesting chocolate or intensity of flavour? 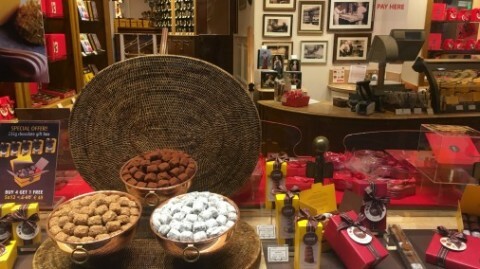 The big names in Belgian chocolate have multiple shops in the capitol, sometimes even on the same street! Happily there are clearly some very exciting chocolatiers working in Belgium. The judging was varied, often interesting, sometimes unmistakeably world class delicious. It was a great pleasure. 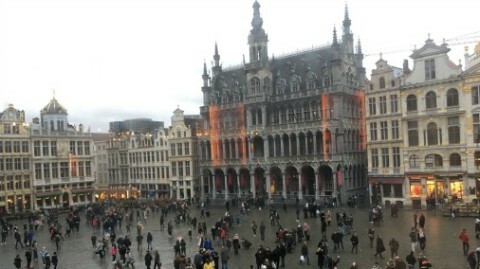 The glorious Grand Place, where we were lucky enough to be located. We were lucky enough to have Belgian chocolate expert Peggy Van Lierde on our side. 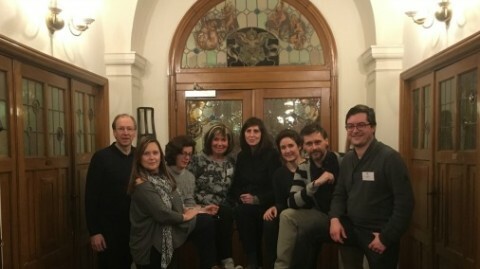 Thanks to her organisational efforts we had a crack team of Belgian experts with us, and the most stunning venue for our judging. We were in the wonderful Maison des Brasseurs; in other words the Beer Museum. This is situated at the glamorous heart of Brussels; the Grand Place, and we were surrounded by the ornate gilded buildings of this central square. Our crack team of Belgian and international Grand Jury. Although night-time Brussels meant sleep was a little elusive at our centrally located hotel, it did make for a very fun visit. The city seems a modest size, with the centre easy to walk around, and lots of fun happening at street level. One night we hit a stretch near the old stock exchange where lots of Asian restaurants tempted and we sat down to a fresh and delicious Thai meal. Judging chocolate all day leaves me craving a savoury hit! Another night we ate at a more traditional Belgian brasserie, where chips and Weiner Schnitzel were among the well made treats on offer. 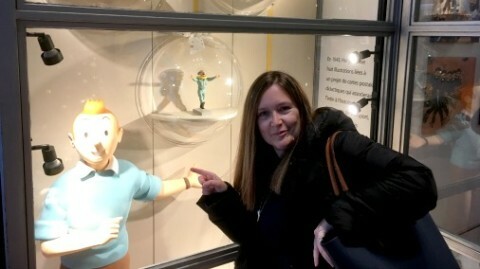 Of course Tintin is another important Belgian visitor attraction. I would say my favourite meal each day was breakfast at Pain Quotidien, (my fellow judges were mocking when they discovered I didn’t know the chain was Belgian). 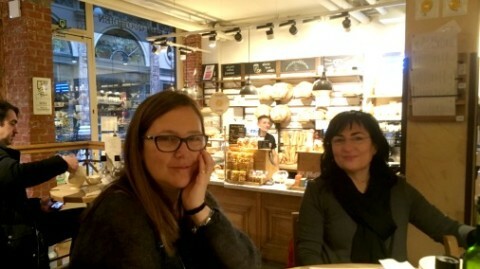 Pain Quotidien is not cheap, but the wonderful granola with creamy yoghurt and fresh fruit was a fabulous way to start each day, and a happy moment shared with the Italian partner of the Awards Monica Meschini and Awards photographer Giovanna Gori. Their company each day before we knuckled down to judging was fun and restorative, and charmingly added to by the glorious setting. The branch we were frequenting is in the Galerie de la Reine; one of the prettiest visitor spots in the centre. It is a beautiful covered walkway of shops, with of course some of the city’s smartest flagship chocolate shops. 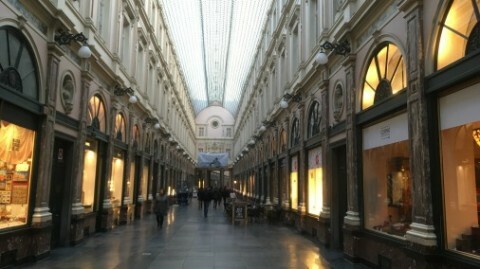 The Galerie de la Reine, breakfast venue on the right. Monica and Giovanna waking up over breakfast. I thoroughly enjoyed my first experience of Brussels, watching the world go by as I woke up over my granola, walking about the historic city centre, and getting to know the past, present, and exciting hints at the future, of Belgian chocolate. 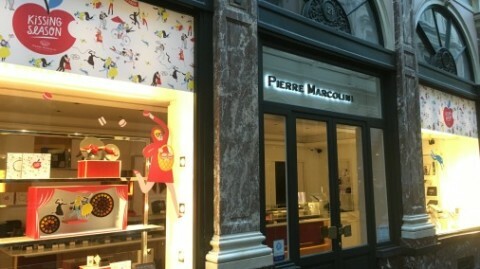 Frenchman Patrick Roger has a striking flagship store in the Belgian capitol. It is the easiest hop and a skip on the Eurostar from London. So I suggest you plan a sweet escape, and make sure to take this with you: the International Chocolate Awards Belgian winners list 2017! Multi-award winning Laurent Gerbaud won big again this year – well worth a visit!